Text message attributed to Turkey’s president calling citizens onto the streets in defense of their democracy. Widely shared. The aftershocks of the failed coup attempt against President Recep Tayyip Erdogan and his ruling AKP (Justice and Development) government, which left over 200 killed, mostly civilians, and some 1500 wounded, continue to grow. Within hours after Erdogan described the attempt as “a gift from Allah” which will help his government cleanse the army, almost 3,000 soldiers were arrested, and some 2,700 judges dismissed. This was followed by a witch hunt as more than 8,777 personnel, including policemen, governors and generals were deposed. Most recently, the country’s Higher Education Board has asked for the resignation of all the deans of the state and private universities in the country, while the teaching licenses of 21,000 teachers and the broadcasting licenses of 24 TV and radio stations have been revoked. Travel restrictions are being broadly implemented across different professions, while public exhortations to reinstate the death penalty have been met receptively by the leadership. The dangerous path Turkish society has been dragged onto, both building up to the coup attempt and in its immediate aftermath, is one of ever deepening social polarisation. Critics of Erdogan’s rule say it hasn’t arrived there accidentally. 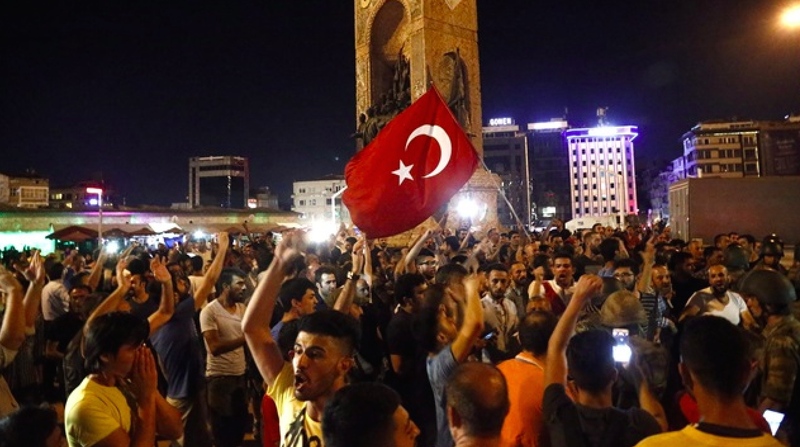 Government officials and pro-government organizations asked supporters to take to the streets on July 15 to avert the military coup, and once it was clear the coup had failed to remain there and “celebrate the victory of democracy”. The directorate of Religious Affairs ordered imams all over the country to call people to these democracy celebrations using the loudspeakers of mosques. Now is the time to show real Islam. This is a jihad! For Allah’s sake, let’s not stay at home and go out. May God give no opportunity to traitors. All citizens across the country received the “democracy” call via SMS, undersigned by Erdogan himself (top image). This call was responded to by thousands of AKP supporters, who were able to use free public transport to gather at strategic points in the city. Extensive media coverage — back operating at the state’s behest after blackouts enforced by the soldiers — praised the determination of people to block the anti-democratic coup attempt. Images of crowds filling the main squares of cities including İstanbul’s Taksim square and Ankara’s Kizilay square, both of which have witnessed opposition gatherings crushed by police in the past, were widely circulated. Image from Yeni Safak. Used with permission. Given the relentless nature of government attacks on media, protesters and opposition figures in the last year or more, the democracy narrative promoted by the government appeared deeply ironic to some that disputed the characterisation of those that repulsed the coup as heroic civilians confronting traitors. It wasn’t the resistance of the civilians which stopped the coup, nor was their resistance for democracy. […] The civilians who took to the streets fought as a crowd joined to the police in a conflict that was essentially between power structures […] They were used as shields or put forward as human subjects, and occasionally became the target of bullets […] The only moments we witnessed the ‘militancy’ of the people were when soldiers surrendered with their guns and tanks. This so-called militancy was recorded in the form of lynching surrendered, unranked soldiers, cutting their throats, and posing on top of seized tanks. Allegations about a soldier’s throat being cut by civilians are yet to be confirmed. Although extremely graphic footage of a crowd celebrating the soldier’s lynching was widely shared and even praised by some, there is still no concrete evidence of the soldier being executed, and no official cause of his death. In their testimonies, arrested soldiers said they had no information about the coup attempt as they were allegedly briefed by their commanders that they were being deployed in a military exercise. Turkey enforces compulsory military duty on every male citizen after the age of 20. Erdogan-AKP supporters, who took to the streets in 15 July, are turgidly presented as a role model for being insurgents of democracy to the whole AKP grassroots. […] AKP, which asks its supporters to take to the streets ‘until the problem is solved’, is opportunistically imprinting its own dictatorship project on society under the guise of ‘a bottom-to-top’ popular movement. His account is symptomatic of the fears that many secular Turks harbour as Erdogan begins the inevitable process of strengthening control following the coup. Typically they sense in the massive counter-reaction to the coup a collective rage on the part of AKP supporters that can be misdirected towards any target that is perceived as anti-Erdogan. On the same night Turkish democracy was supposedly saved, for instance, there were reports of groups attempting to invade and attack Gazi in Istanbul and Armutlu in Antakya, two neighbourhoods with secular and left-wing identities. Pasakosku neighborhood in Malatya, predominantly inhabited by Alevi minorities, was another venue of social tension, while a protestant church in Malatya and a Catholic church in Trabzon were reportedly damaged. There were also unconfirmed anecdotes that spread from the rallies of women facing harassment from AKP supporters on account of their “inappropriate outfits”. But the greatest risk inherent in the massive top-down mobilization of supporters of a divisive government is that it triggers a counter-mobilization, and potentially a sustained cycle of antagonism and violence. On the night of the coup attempt in Diyarbakir, the administrative capital of the embattled Kurdish-populated region in Turkey’s east, an unidentified person reportedly attacked the pro-AKP crowd with home-made explosives thrown from a car. Luckily, no causalities resulted but pro-Kurdish law maker Ertugrul Kurkcu from the opposition HDP People’s Democratic Party warned that tensions were high: “People are now setting up self-defence units to protect against AKP mobs,” he told Al Jazeera. And in Hopa, nine youth were arrested on the grounds of “interfering with coup-opponents and supporting the coup”, after getting into a physical standoff with the AKP supporters. This new ‘anti-militarist’ mass mobilization in Turkey has been building up (as a counter-revolt) ever since the anti-government Gezi protests in 2013 and is targeting minorities, alcohol consumers, and all kinds of opposition, as well as military personnel. In October 2015, close to 100 pro-Kurdish activists in Ankara were massacred in an ISIS-linked bombing. Witnesses saw police deploying tear-gas against survivors, and blocking ambulances trying to reach the injured. That tragedy is now coupled with mass action against the dead: during the recent anti-coup celebrations, ‘pro-democracy’ masses destroyed a monument to the Ankara victims. There is no question about where the sympathy of these masses lie. Not long after government supporters in the streets were cheerfully celebrating “democracy”, Erdogan announced a three-month state of emergency giving the government broad extra-constitutional powers to the latest challenge to its authority and vision for the country, and also suspended Turkey’s commitment to the European Convention on Human Rights. This entry was posted in International, Religion. Bookmark the permalink.